Speaking to senior officials earlier this week at an Iranian Space Agency (ISA) meeting, the ISA Director Mohsen Bahrami announced that Iran will launch two indigenously built satellites in the very near future, and that three other satellites are currently being manufactured. The two satellites due to be launched are the Mesbah-2 and the Nahid. Mesbah-2 (Mesbah is Farsi for ‘Lantern’) is a limited application communication satellite that is indigenously designed after the original Mesbah project failed to materialise due to international sanctions on Iran. Mesbah-2 is supposed to have an operational life span of three years with store and dump communications capability and its own navigation system. It was originally scheduled for launch in 2012. The original Mesbah satellite was to be built by Iran in cooperation with Italy’s Carlo Gavazzi Space, now a subsidiary of German satellite manufacturer OHB Technology. Mesbah was also a low-earth orbit store and dump communications satellite. The original Mesbah satellite was never launched as both Russia and Italy refused to cooperate with Iran on satellite projects due to international sanctions. 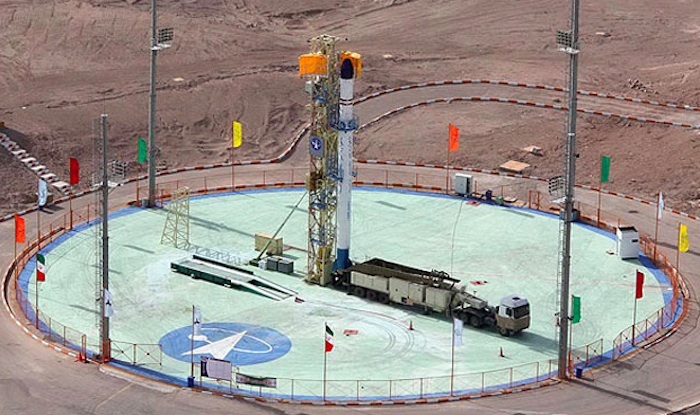 In April 2011 the original US$10 million Mesbah satellite built in Italy was not delivered to Iran, with Italy refusing to hand over the satellite to Iran because of the sanctions regime. Iran maintains to this day that the satellite be handed over for its launch by an Iranian launcher. The Nahid (Farsi for ‘Venus’) communications satellite was also originally scheduled to be launched in 2012 and has folding solar panels. Nahid is designed and jointly manufactured by the Amir-Kabir University of Technology in Tehran and the Iranian Space Agency’s Aerospace Research Institute. Nahid will weigh about 55 kilograms and operate in the Ku-band. The three satellites currently being manufactured by Iranian entities are the Amir Kabir-1, Zafar, and Doosti. The Amir Kabir-1, also known as AUTSAT-1, will be a remote sensing satellite that weighs 70-80kg with a resolution of about 80 metres, and is designed to provide post-disaster surveillance (such as earthquakes) and agricultural applications. Amir Kabir-1 is designed by the Amir-Kabir University of Technology, and is to be manufactured by the university and by a company called Iran Aerospace Industries Organisation. The Zafar (Zafar is Farsi for ‘Victory’) satellite is also supposed to be used for remote sensing with a resolution of 80 metres. Expected to weigh about 85kg, the Zafar is supposed to provide meteorological and water boundary mapping data. Lastly, the Doosti (Farsi for ‘Friendship’) satellite, also a remote sensing satellite, is being developed by the Remote Sensing Laboratory of the Iranian Space Agency and is expected to weigh about 50kg. All of these satellites are supposed to be launched by either the Simorgh or Safir space launch vehicles from one of Iran’s three launch facilities. Many space analysts expect to see increased space activity from Iran with the anticipated unraveling of the international sanctions regime over the coming months and years.